I learned to ride a horse specifically for my trip to western Mongolia. That said, you can travel around in jeeps or even buses, though very rarely will you see paved roads. The most sparsely populated country in the world with just under three million inhabitants in a country bigger than France, Belgium and Germany combined, somehow, wherever you go, you’ll find a lone horseman or family in their ger, the nomad’s tent that is still forms home to nearly half the population for part of the year. Ulaan Bataar is the capital and though a drab city more reminiscent of the former Soviet Russia, it holds a certain fascination and is home to about half the country’s population. A huge country, wherever you see it, the Nadam Festival is a major attraction. Whether you plan to travel in central Mongolia, the far west, or the hot and sandy Gobi desert, you shouldn’t miss out on riding across the plains, or staying in a nomad’s tent or ger, vacations don’t come any better than a trip to this wonderful country. This is the highlight of the year, a three-day annual festival of horse races, wrestling and archery. Celebrated all over the country in July (the best time to travel in Mongolia, when it is sunny and dry), this is a must see event. If you happen to be planning a trip to Mongolia in july than make sure you plan a trip to this wonderful Festival. Since Genghis Khan (and probably before), horses have figured large in the lives of Mongolians. Nomad families in the central, eastern and western areas of the country rear large herds of horses. From an early age, children learn to ride and horses are the best means to get about in the remote areas. Be warned, saddles are made from wood, so if you plan on going on any extended horse riding expedition, be sure to bring more comfortable (usually Russian) leather saddles. Horse trekking across the steppes, or exploring the valleys and hills in western Mongolia can be a good way to get close up to the way local people lead their life. Don’t miss a chance to stay the night in a traditional ger. These homes are made from hair from goats beaten to make a thick, insulating felt cover. Warm in the winter, they protect from the heat in the summer. A ger can be taken apart and erected within a few hours. If you get the chance to stay with a family, why not help milk the goats. Life revolves around these little animals (and horses). The nomad diet is limited: milk, cheese, cream and kumis, fermented mare’s milk, but if the occasion demands, a goat may be slaughtered. Every part will go in the pot, boiled and eaten, eyes and all. This is where Mongolia meets the Stans: Kazakhstan and Kyrgyzstan. 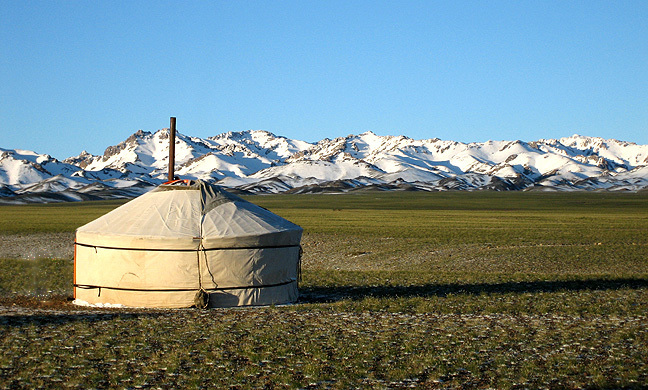 You can distinguish the Mongolians’ ger from their cousins’ yurts however (yurt is the Russian name for the same thing), as the former is more of a round dome, while the latter rises more to a point in the centre. In the far west though, you can see both close set up close to each other. Turkic languages, though not the same, there is enough in common that Kazaks, Mongols and Kirghiz can communicate. Western Mongolia is where you find the eagle hunters who still rear eagles to protect their sheep from wolves and use them to hunt in the summer months. The eagles can weight up to 6 kilos, and with a wingspan of up to two metres, can bring down a wolf. In the summer, they ‘rest’ and get fat and though this is when the wolves might be less likely to attack the nomads’ animals, it sometimes happens. In the far north west, going up towards Siberia you find the Darhad Valley, home to some of the most self-sufficient people in the world. Temperatures fluctuate from 30 degrees Celsius in the short summer, falling to minus 54C during the long winters. This is also where you can see the shallow Uvs Nuur Lake, Mongolia’s largest lake (about 84 by 79 kilometres) that pokes into Tuva in Russia. It forms one of UNESCO’s largest World Heritage Sites, listed since 2003 for being one of the largest intact watersheds in Central Asia, containing thousands of archeological sites from nomadic tribes like the Scythians, Turks and Huns. Another north western alpine lake, Khovsgol Lake is home to the reindeer herders. As well as being the second largest freshwater lake in Asia, it is home to almost 70% of Mongolia’s fish. This is the place to go for kayaking and trekking. Closer to Ulaan Bataar, central Mongolia is made up of rolling steppes as far as the eye can see. This is where you can still see a few of the last traces of Genghis Khan’s huge empire. By his death in 1227 he ruled the territory between the Caspian Sea and Sea of Japan. At Karakorum, you can still see a few remains of Ogodei Xaan’s palace in the ancient capital of Genghis’ empire, along with some more recent sixteenth century temples and monastery. In contrast to green steppes that stretch as far as the eye can see, the southern area of Mongolia is covered by the Gobi Desert, a flat, inhospitable desert area where few people live. This is where you find camels rather than horses, plying part of what used to form the ancient Silk Road route. A huge country that takes days to cross by land transport, this is a country of great contrasts, where the traditional life of nomads continues, and where horse-power takes on a whole new meaning. These kind of events looks very interesting. I will definitely make trip to Mongolia this year.